But if you’re determined to try to keep your house as clean as you can by yourself, it might be worth noting which places are the most commonly missed when it comes to giving your home a good going over with a mop, brush and vacuum cleaner. Do you, for example, scrub your doormats once in a while? Since they lie at the entryway to your house, it makes sense that they’d be one of the dirtiest items at home. Once a month, get the vacuum out and give them a clean. You could even wash them if you’re feeling especially virtuous. And what about your skirting boards? Take a look around and you’ll see what we mean. 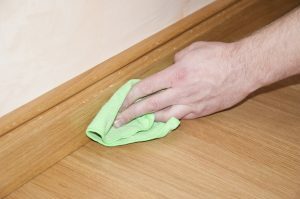 Skirting boards can quickly become quite black with grime and it often goes unnoticed, but it can make your home look dirty to newcomers so try and wash these down once in a while. Light switches are also a real culprit when it comes to making your home look a bit grubby. If you look at your switches right now, we bet you can see a few dirty fingerprints on the plastic – and maybe even on the wall! Get the sponge out and give them a quick wipe down once a week. If you need a bit of help, check out this article on the Daily Mail website about how helpful tights and pantyhose can be when it comes to the cleaning! ← Student Finds New House Dirty & Damaged – With Hair In The Carpet!